As a customer of Glow Studios and a friend of the owner Mrs. Jessica DeVilbiss, I invite you to celebrate with her the anniversary of her fantastic spa located in Ahwatukee. 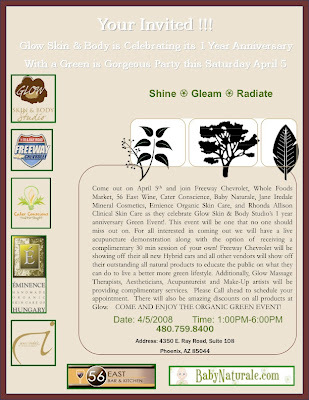 Please stop by to support a wonderful Entrepreneur, her Green initiative and to support her salon. I love Glow Studios and highly recommend the experience.